Seven years after the events of the first part the Aztecs are ready to revolt against the mighty Tepanecs, especially that the Tepanec empire is in turmoil. The palace politics have left the realm of intrigue and entered the world of military action, betrayal and murder. Those are interesting times but also very dangerous ones. The young Emperor is trying to solve the problems peacefully – he is focusing on great constructions, not on the army. However, his warlords and advisers believe he is making too many mistakes along the way. A much stronger leader is needed, somebody not afraid to take risks, somebody with charisma, but is there a way to change Emperors with no bloodshed and strife? Kuini is now an adult, experienced warrior, a promising leader of men and also the head of a small family. Dehe, his wife, bore him a daughter and twin boys, she is currently pregnant with another one. Still many people consider him just a pushy foreigner with mixed blood who has raised far above his station. How dares he to visit the palace and enjoy the favours of Iztac Ayotl, the favourite and influential wife of the Emperor? What’s worse, Kuini is also hated by the Emperor himself, as if the young man could feel that his beloved First Wife and the foreign warrior she trusts so much share something more than a few friendly smiles. With Tenochtitlan’s palace plots turning ugly and Coyotl being away on a diplomatic mission, Kuini is about to find out that meddling in the Aztec politics could cost him more than he is prepared to pay. Will he stop being short-sighted and selfish in time to save those he loves the most? It is the end of a great series. What can be said? I have only one regret that all things must come to an end and good things end definitely faster than the bad ones. I will miss sharing the lives and adventures of characters I grew very fond of, while following the fates of Kuini and Coyotl and learning about the pre-columbian Mesoamerica. There is also one consolation – I can always re-read the books at a later time again, sure in the knowledge of discovering new aspects in an already familiar world, it will be like coming home. It is obvious from the detail and accuracy of the historical data that the author did her research and stayed true to the history of the great civilization of Aztecs, showing those people as real human beings, not just props. I loved the fact that such historical leaders as Tlacaelel and Itzcoatl were mixing here with fictional charactels like Kuini or his uncle. I loved the way Zoe Saadia has developed each of the main characters into strong adults, instilling each of them with their own unique personality which is easy to identify with and follow. I loved the dynamics between Iztac, the powerful Empress with a dangerous secret, and Dehe, the fulfilled mother who love – and are loved by- the same man. The author was clever enough to make them meet quite often to keep the tension, and suspence, on a very high level. Is a happy ending possible, with the rivalry between those two very strong and intelligent characters? It seems improbable but the answer is ‘yes’. Overall Ms. Saadia’s ability to lead the narration in such a way that it keeps you on your toes, to make you pause at certain events, is uncanny. In many ways, the story mimicked life for all of us: you know something is coming and yet you are still surprised at the outcome. I admit I would never ever guess the ending of this book; still it left me satisfied and there were some scenes and topics which I whished she included in previous parts, like more political plotting or religious rituals. In fact, the scene in the temple of Tlaloc, the god of rain, was one of my favourites :). I’ve praised Zoe Saadia many times before and I really have nothing new to add. Let me just tell you this: if more indie writers published such interesting, well-researched books, featuring non-nonsense plots and a bunch of likeable characters I could relate to, I would be far more willing to accept their novels for review, even on a daily basis. Believe me, the badge below is fully earned. 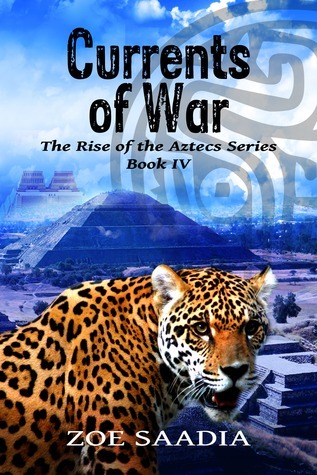 This entry was posted in book review, historical, one brilliant book and tagged Currents of War, good historical series, recommended, The Rise of the Aztecs, Zoe Saadia. Bookmark the permalink. The series is over already? !